KISSIMMEE, Fla. — Braves general manager Alex Anthopoulos found spring training insurance behind the plate in the form of Chris Stewart on Wednesday, signing the veteran catcher to a one-year, major-league deal. Stewart’s contract is non-guaranteed, though the team is interested in keeping him within the organization if he does not make the Opening Day 25-man roster. The Braves moved reliever Grant Dayton, who is recovering from Tommy John surgery, to the 60-day disabled list to clear space for Stewart on the 40-man roster. “If something were to happen, you always need depth,” Anthopoulos said. “We’ll see how he looks in camp and we’ll obviously have to make a decision at the end of camp on him. Want to be clear it doesn’t change anything with Flowers and Suzuki. Anthopoulos stressed that Flowers, in particular, is not behind schedule after undergoing surgery on his left wrist and lower left arm. 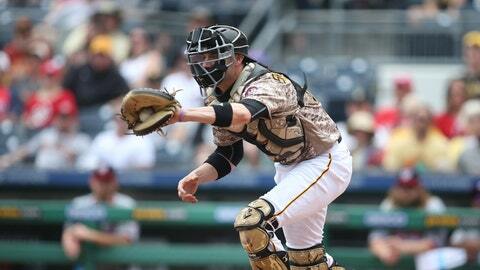 Stewart, who will turn 36 on Feb. 19, is a journeyman catcher with six different MLB uniforms in his rearview mirror, spending the past four seasons with the Pittsburgh Pirates. He owns a .230/.298/.293 career slash line, though Atlanta is more intrigued with his defensive aptitude. If Stewart did stay in the organization, the team believes he would be an asset at Triple-A Gwinnett for young arms like Kolby Allard, Mike Soroka and Touki Toussaint.